VNPT Data Review 2019: Is VNPT Data a Good Hosting? One of the leading hosting companies in Vietnam, VNPT data offers stable, fast, and reliable hosting solutions a number of complementary services across major cities. The company maintains servers in six secure locations. VNPT Data is located in Hanoi, Vietnam and is an ICANN-accredited domain registrar and a reputable hosting service that provides shared hosting, VPS servers, email hosting, Cloud solutions, and web design services. With a commanding 65% market share, it’s the largest hosting service in Vietnam. Over the years, VNPT Data has invested in world-class infrastructure that allows them to deliver stable hosting and value-added services, such as system backups and storage solutions. They also strive to deliver high-quality services and support. Whether you need VPS, Cloud, system administration, CDN, real-time monitoring, and information security, VNPT Data can cater to your technology needs effectively. If you’re starting out, I recommend the Medium Plan. It’s quite fast and stable. With it, you get 15 GB transfer bandwidth and 730 MB storage which can support 10 subdomains and personalized emails. The other good option is the Advanced Plan that comes with 1.5 GB storage space and unmetered bandwidth in addition to 20 subdomains and 30 mailboxes. But that’s not all. In case you need hosting packages with slightly more storage space and unmetered bandwidth, I’d suggest you choose either the Pro Plan or the Super Plan. With 2.5 GB and 3.5GB, the difference in space isn’t significant. Both can support five add-on domains and 50-70 email boxes with any of your domains. Their ultimate package is the Max Plan. The package gives you unmetered bandwidth and 5 GB storage space that can support seven add-on domains and 100 mailboxes. I expected more features not just with this plan, but with the starter plan. 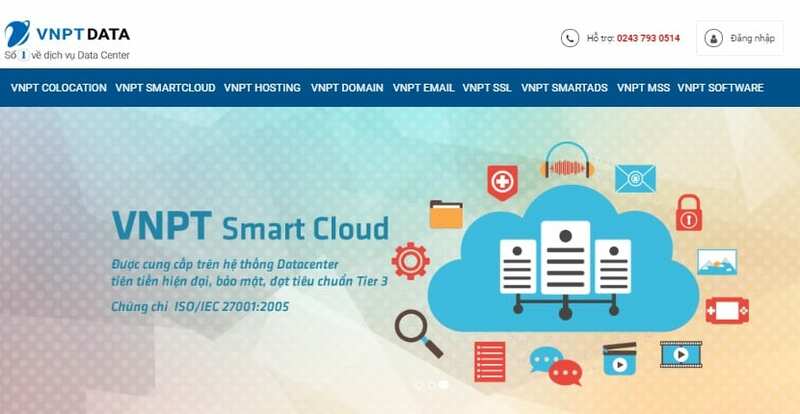 If you want to own physical servers in Vietnam without spending any money or time running and maintaining them, your answer lies with VNPT SmartCloud. Simply rent server space in their facility and ask the technical support team to set up your hardware and configure it properly. With 24/7 management and support, you’re assured of flawless uptime. You can choose from eight robust plans that run on CentOS, Ubuntu, or Fedora. With the SmartCloud you get, 1-6 CPUs, 512 MB – 10GB RAM, 20-160GB HDD, 1 IP address, and 50-200 MBps transfer bandwidth. The good thing about their on-demand services is that you pay only for the storage, processors, and bandwidth that you will use. When you look at their pricing, you can tell VNPT Data has everyone’s needs in mind. They offer pocket-friendly rates for starters and premium rates for those who require more storage space and transfer bandwidth. My only concern is that their packages are not feature-rich. I know of a good number of hosting companies with far more features. Being a trusted partner of cPanel and Oracle as well as hardware vendors, such as Dell and IBM, VNPT Data gives you the benefit of using licensed software at no extra cost. You can also get add-on domains, more hosting space, email boxes, and SSL certificates at a reasonable price in addition to Cloud-based solutions. VNPT Data boasts of a highly skilled IT support team that’s available 24/7. Friendly and professional, they can provide you with fast answers and adequate support on a range of issues. Live chat support is in Vietnamese while the hotline and contact address are all local numbers and addresses respectively. They can help you configure your servers, troubleshoot hardware, perform disaster recovery, and carry out website transfers quickly. VNPT Data is a great choice if you’re looking for a local hosting service with outstanding infrastructure, flexible packages, and an able technical team. Wondering how VNPT Data stacks up against other Web Hosting companies? Enter any other Web Hosting company and we will give you a side-by-side comparison.